Now that it's getting colder (still only around the freezing mark), it's time to bring on the snow. If we're going to suffer with the cold...at least we'll have something pretty to look a t while we shiver inside our winter layers. We did get some snow: the kind that you peer out your window, not breathing, not moving, not blinking, cause you'll miss that snowflake if you do. So many winter patterns on the 'net. And (as the saying goes) so little time. 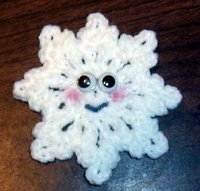 I have a free pattern for Sweetie the Snowflake fridgie, shown at right. Click on her picture for the free pattern. Use thread for a smaller snowflake, great for Christmas trees or garlands, or to make and attach a long chain and tassle for a bookmark to insert in greeting cards. Now, a little birdie told me a birthday is coming up. Okay, so I'm the little birdie, and I'm the birthday girl. How old? 29. Same as last year. And the year before. And hopefully for a few more years, until someone looks at me funny when I tell them I'm 29. I'm thinking of a special special for that day only (December 10) so keep an eye here or on my site for details.